All the music on this CD is by composers who, in various ways, have been deeply influenced by profound religous or cultural encounters. Most of these encounters have concerned traditional Christian orthodoxies; but some have been syncretic in that they draw together traditions that are contrasting, and sometimes opposed. For each composer, the struggle with ideals of belief and art, and to find ways in which music can epitomise those ideals, has been a quest, often involving the reconciliation of inner contradictions. In Conjectures of a Guilty Bystander (1966), the free-and-deep-thinking Catholic mystic, Thomas Merton (1915-68), wrote that "The wise heart remains in hope and contradiction, in sorrow and in joy ... the wise heart lives in Christ (p. 192)" - a place between. My own words about the Louth Contemporary Music Society's new CD, A Place Between, will be brief. That opening quote from Martin Adams' excellent booklet essay shows that this CD is put together by people who know, and care, about contemporary music. If you are a regular reader you will know the type of music that features regularly on this blog; the track listing above shows you are going to find it on A Place Between. The quality of the music is, needless to say, outstanding. It is matched in quality by the performances, by the packaging (from which all my graphics are taken), and by the sound captured in St. Peters Church of Ireland, Drogheda. The folks at Louth Contemporary Music have their priorities sorted. No celebrities talking the music up, but instead well deserved photos and credits for producer Eamonn Quinn and sound engineer Peer Espen. If I were CEO of a major corporate record label I would send a copy of A Place Between to every member of my classical division. And I would demand an explanation as to why an impecunious independent label can produce something this important, while my own staff continue schmoozing teenage opera stars at industry award events. 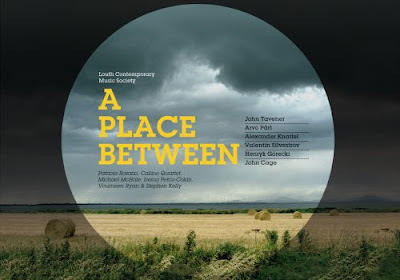 A Place Between is available as a CD for European purchasers from the Louth Contemporary Music Society website, where there are also audio samples. Purchasers outside Europe can buy from CD Baby. Or anyone can be listening in just a few minutes by downloading the music from iTunes. Thank you VERY much for this review. I just bought the CD from CDBaby and are anxiously awaiting it to arrive here. I agree with you that there are many excellent independently produced CDs out there. I am always wondering why the more traditional media are not reviewing these CDs?